These cars must be used on flat level surface like concrete, asphault, very short grass, inside a gym, etc. No dirt or gravel allowed. Our Ferrari Kids Race Cars are professional pedal cars with 4 wheels for added stability and feature coaster brakes and an easy to adjust seat to fit kids of all ages. Leave it to Arizona Bounce Around to have all the cool race cars for kids parties. 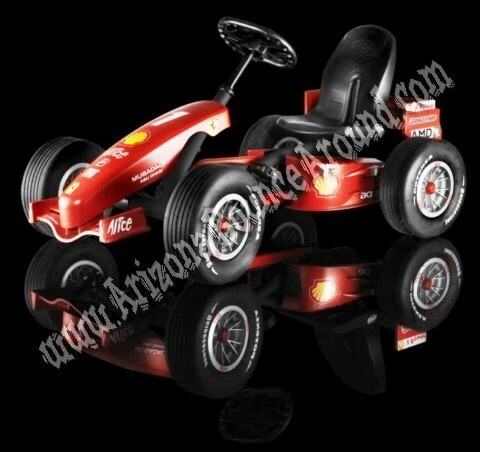 Our Ferrari brand kids race cars are great for any type of racing party and can be ridden almost anywhere. You can ride the race cars at parks, block parties, company picnics or cookouts, inside the school gym, building or your at your house party. Every one will have fun with the kid's race car rentals from Arizona Bounce Around including parents or teachers. What a better way to have a Race themed party or team building than to have a few laughs with the kids race car rentals. Our kid's Race Car rentals come complete with orange cones and small skateboard helmets for safety or you can create your own race course. We also rent huge inflatable race tracks to ride the Ferrari kids race cars in for that really cool race. Our kids race cars sit low to the ground to make them more stable and feature mfortable back rests, pedals with grips and reflective safety tape for safety. Rent all of your kids race car equipment from one place by calling 480-874-3470 today and have a race party to remember.